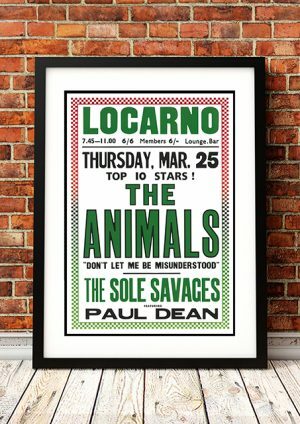 Classic Animals Band Concert Posters and Memorabilia! Buy Online Now! One of the most important bands originating from England’s R&B scene during the early ’60s, the Animals were second only to the Rolling Stones in influence among R&B-based bands in the first wave of the British Invasion. The Animals had their origins in a Newcastle-based group called the Kansas City Five, whose membership included pianist Alan Price, drummer John Steel, and vocalist Eric Burdon. Price exited to join the Kontours in 1962, while Burdon went off to London. The Kontours, whose membership included Bryan “Chas” Chandler, eventually were transmuted into the Alan Price R&B Combo, with John Steel joining on drums. Burdon‘s return to Newcastle in early 1963 heralded his return to the lineup. The final member of the combo, guitarist Hilton Valentine, joined just in time for the recording of a self-produced EP under the band’s new name, the Animals. That record alerted Graham Bond to the Animals; he was likely responsible for pointing impresario Giorgio Gomelsky to the group. We stock some awesome Animals Band Concert Posters.